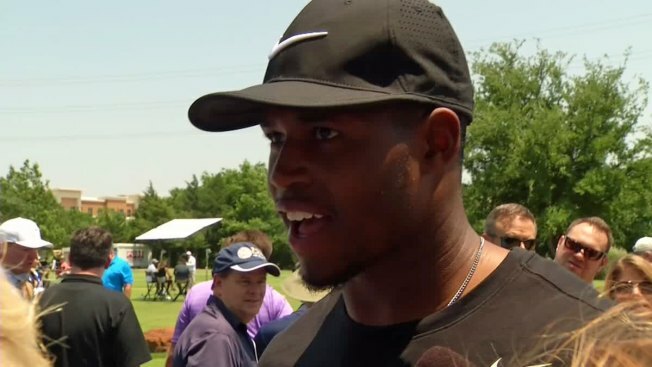 Cowboys running back Rod Smith said playing on America's Team with his brother, Jaylon Smith, is a dream come true. Rod Smith said "not in a million years" could he have imagined playing on the same NFL team with his brother, wh ended up being the Cowboys second round pick in the 2016 NFL Draft. The two Smiths went to different high schools and colleges, so this will be the first time the brothers can say they're teammates. Jaylon is coming off major knee surgery that could force him to miss the 2016 season. Rod said he's offering brotherly support and that Jaylon will overcome this injury. "This really was his first real adversity, so all I can just do is try to be the big brother, play my role and keep his mind focused on the long-term goal. It's only a matter of time until he's 100 percent healthy. He's already ahead of schedule, so that's the good thing. He's a pretty mature young man and he's handling it the right way," said Rod Smith. The older Smith brother played 10 games for the Cowboys last year as a backup running back, but he'll transition to fullback this offseason. It gives him a better chance to make the roster and block for his college roommate, Ezekiel Elliott. "It gives me a better chance because I'm reading basically what the running back is reading, and I have pretty good vision. Usually the running backs are going off the full backs so hopefully I can be able open it up some more," said Rod Smith.